Two of Washington’s former Republican officeholders are throwing their support behind independent presidential candidate Evan McMullin. They’re volunteering themselves and others as a slate of Electoral College members to vote for McMullin if he carries the state. OLYMPIA — Decked out in dark suits, Slade Gorton and Sam Reed stood Wednesday in the Washington Secretary of State’s Office, looking very much a dapper pair of silver-haired Republican ticket-splitters. Gorton, a former U.S. senator and state attorney general, and Reed, a former secretary of state, had come to rebuke their party’s presidential candidate, Donald Trump. It was a symbolic gesture, they admitted, for a state that appears likely to support Democrat Hillary Clinton by a comfortable margin. Nonetheless, the men stood here to personally deliver the names of people who would cast votes in the Electoral College for Evan McMullin. That is, they’d cast votes for McMullin in the unlikely event the independent presidential candidate — who isn’t on the ballot here — won Washington state with a write-in vote. “We want to make him as official a candidate as we can,” said Gorton, as he handed over the list of names to a worker in the office. The list has 12 names — including Gorton and Reed — plus four additional, alternate names. Asked where he got the names for the electors, Gorton quipped, “I called Sam Reed.” He added that the McMullin campaign also supplied a few names. McMullin, a former CIA officer who graduated from Auburn High School in southern King County, answered that prayer. 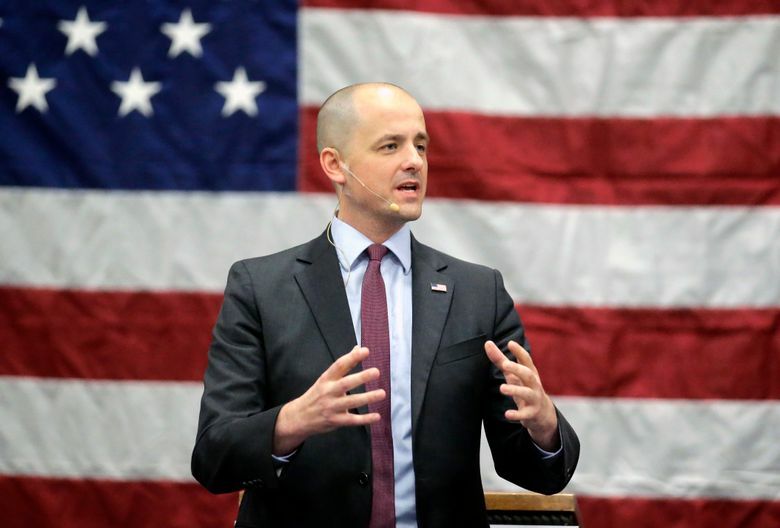 McMullin entered the presidential race in August, and in one of this year’s many surreal election twists, now has a chance of winning Utah, where he was born and graduated from college. Gorton said their support of McMullin sets an example for Republicans who are so distraught by the notion of Trump that they’d consider sitting out the election.